Sometimes DreamMaker team would release new firmware on the internet. Usually, a new firmware would add new features to the OverLord, fixes some existing bugs of the last version, and in total enhance the user experience of OverLord. However, sometimes firmware is specially designed to match some special hardware change of the machine or just for testing. Installing these “special firmware” would sometimes damage your machine. That’s why we would recommend you read the update information before installing a new firmware. Install Cura version 15.04 or newer. Download the firmware .hex file in your computer. Connect OverLord with your computer using a USB wire. 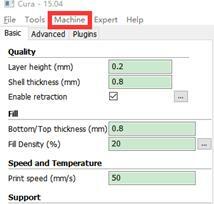 Start Cura and go to “Machine” > "Install Custom Firmware" (make sure the correct machine is selected in the “Machine menu”). Select the firmware you want to upload and then Cura will automatically upload the firmware to your OverLord. If Cura cannot recognize your OverLord, please go to “File”>“Machine setting” and select the serial port yourself (COM3 or others, not Auto). Detected temperature over 280oC or below 5oC by the sensor, another situation is the connection of data bus (10 pin) maybe wrong, it will be tell you the error message. Please turn down the power, find the nozzle transit board. We can see two baffles near the extruder. Find the one with an opening window on the right corner. Using a screwdriver to remove two fasten screws of this baffle. And then you could take the transit board out. Try to re-plug the data bus and turn on the power again. If the message still appear. You need measure the resistance of the sensors, and the normal resistance of it should be around 110 ohms. If the sensors are of correct resistance, this problem may be caused by the bad connection. A little curing glue at the connecting place may help ease the problem. An example is shown in the picture shown below. You could use hot-melt glue or AB glue. If the sensor was broken, you should replace with a new one. Detected temperature over 115℃ by the sensor bed and poor contact of temperature sensor on buildplate, it will send this error message. First you need to check the wire connection. Turn your machine upside down; remove the bottom cover to see if the buildplate sensor wire fails to connect to the main board. 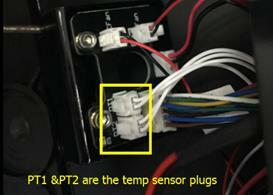 By the way you can also check the resistance of the sensor. The sensor should not be open circuit. 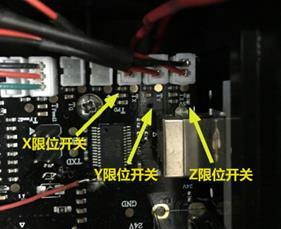 If there is nothing wrong with the sensor and connecting condition is good, then you need to check if the sensor detaches from the buildplate. 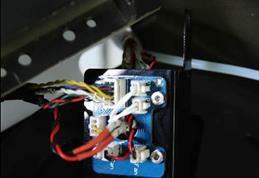 Turn off the power, then disassemble the buildplate and check the temperature sensor at the backside. If the sensor detaches from the buildplate, please apply thermally conductive silica gel onto the connecting place and adhere the sensor back to the center of the buildplate. If this message does not disappear after above steps, please contact support@dreammaker.cc for further support. 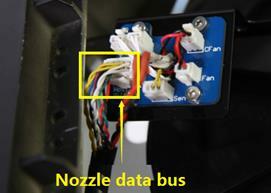 Poor connection of nozzle heating module or the heater is broken. First, please check heater’s wire connection status. 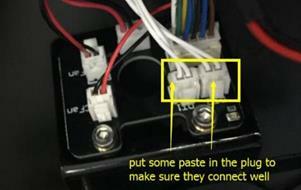 You can check this by turning your machine upside down; removing the bottom cover, make sure the heater wire is well connected to the main board. If the wires connect well, please open top baffle, find the nozzle transit board (Link to How to find nozzle transit board), then you need to check the resistance of the heater, it should be around 10 Ohms. If it is open circuit, your heater is broken. If there is no problem of the heater, check the conductivity of the heater connector (see the picture). Please check this place and make sure the connection well by using the pliers clamp. The error will appear when the mainboard continues receiving signal from the switch for a long time. Then the printer will consider there's something stuck inside the switch or the switch is broken. Turn off the printer. Check the conductivity of the mentioned switch when triggered and when not triggered. How to check the conductivity? (Link to error message X\Y\Z switch broken) Replace the switch if it is broken and email support@dreammaker.cc for further instructions. When the mainboard cannot receive right signal from the switch, this error will show on the OLED screen. This error means that your switch is broken or poor connection between the mainboard and the switch. 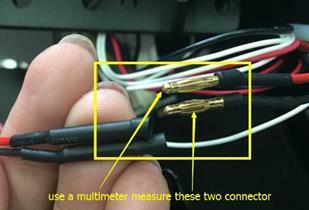 To find out where the problem lies, you need a multimeter and test the mentioned switch of the exact axle. The switch should become conductive when triggered, otherwise it’s broken. If the switch is not broken, try apply some curing glue/sticky tape to the connector to reduce the possibility of poor contact. Usually the problem can be solved. Below picture shows the location of the X, Y, and Z axis switch sockets on the mother board. But if the switch keeps showing open circuit when triggered, the switch must be broken. In this case, please email support@dreammaker.cc with your machine number to get further support. SD card file changed The file that printer is reading has been changed or damaged. SD read error Error occurs when printer reads SD card data. SD search too long For a long time, the printer cannot find the required complete data in SD card. Error while reading SD-card! Error in reading SD card, the SD card may be broken. When above situations happen, please check the integrity of the file, re-import the file, or replace a new one. If you cannot solve the problem, please contact support@dreammaker.cc for further instructions.